I am NOWHERE near the make-up or product diva that my girl Afrobella is, however I know when I like something and I’m willing to share. And lucky me, I have a platform to do just that and then some! Ladies, you know there are plenty of times where you wish for Calgon to ‘take you away’ in any manner possible. Well at The Polish Bar of Brooklyn, they have a little something for those weary feet and mangled mitts. With a pedicure by the name of The Lemon Drop and a manicure called Make Mine Mojitos, I would be ready for a plush day at the spa at the drop of a dime. You will NOT have to ask me twice! There are two Beauty Bars in the Brooklyn area, one in Clinton Hill and the other in Prospect Heights. Any woman will find themselves in a colour induced frenzy with a polish bar of over 350 colours and 4 polish brands. And what is a beauty bar without the new Minx craze? Yes, they can provide that too. 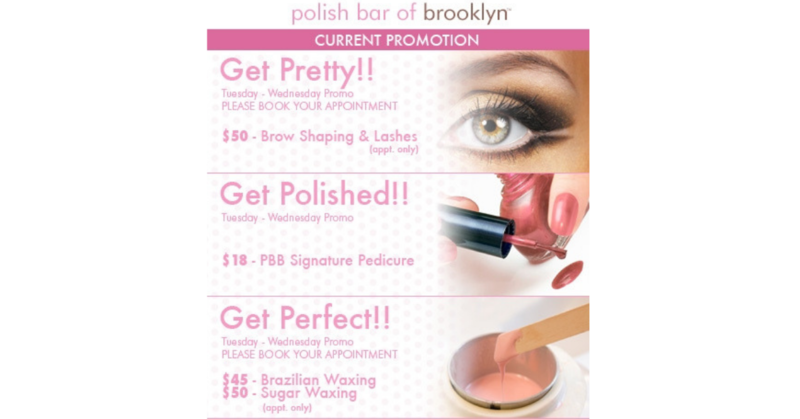 During the summer, look out for The Polish Bar of Brooklyn’s Get Pretty Parties. The thought of being pampered and catered to at my every whim while partying happens to induce a Cheshire Cat grin to my face. A melange of make-up, treats and drinks will be at your service. Not to mention, the tunes on the in house system are a music lover’s dream: Maiysha, Gordon Chambers and Brown Baby Girl mixed in with the likes of Kanye West, Sade, Dave Matthews and customer compilations. I already know where I will be copping my fabulous birthday mani/pedi, I can’t wait! Posted above is their flyer for April specials. Don’t rest on your laurels on this one ladies. And gents, don’t be afraid to take in a special for yourself. Men need some pampering too! Here’s a reminder to check out the site! You can do so here.